The VIGO Walnut Shell glass vessel sink and matching waterfall faucet set will bring an earthy elegance to your bathroom. The VG07038 glass vessel bowl features a unique walnut shell design in a rich brown colour. Handmade with possible unique and slight colour variations, so no two sinks are identical. Glass Vessel Sink in Walnut Shell with Waterfall Faucet in Oil-Rubbed Bronze The VIGO Walnut Shell glass vessel sink and matching waterfall faucet set will bring an earthy elegance to your bathroom. The VG07038 glass vessel bowl features a unique walnut shell design in a rich brown colour. Handmade with possible unique and slight colour variations, so no two sinks are identical. 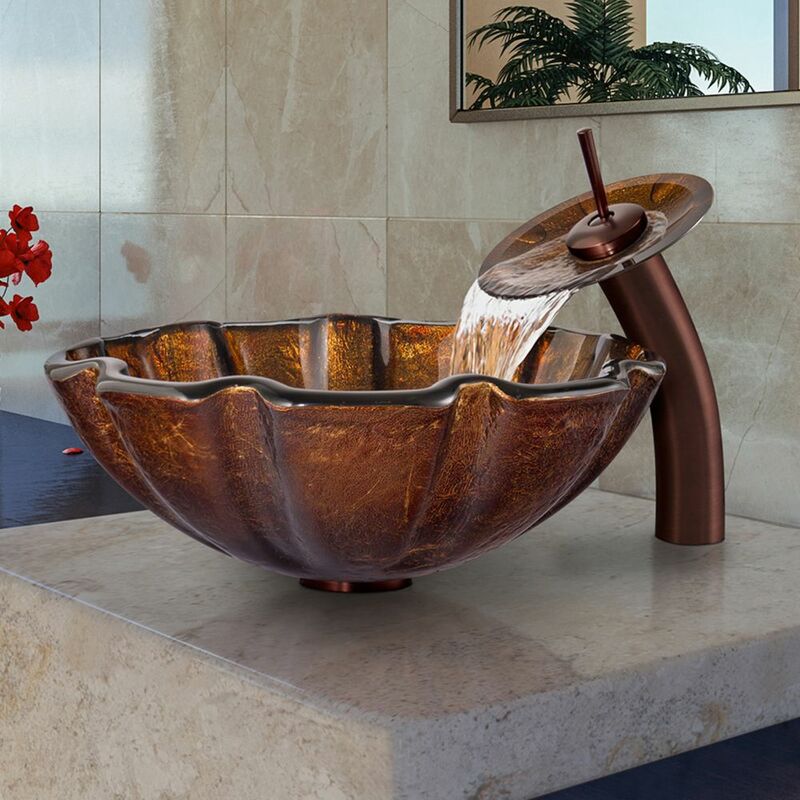 Glass Vessel Sink in Walnut Shell with Waterfall Faucet in Oil-Rubbed Bronze is rated 4.7 out of 5 by 12. Rated 1 out of 5 by HomeDepotCustomer from Everything was bad.... Everything was bad. Rated 5 out of 5 by Brenda from The is a beautifully crafted vessel that added elegance to... The is a beautifully crafted vessel that added elegance to my bathroom. Rated 5 out of 5 by Choochie from High quality Having ordered online I was concerned I wouldn't like it once we installed both sinks. They're not only gorgeous, but high quality vessels and fixtures. Our plumber was impressed and so are we. I bought some other products from Vigo subsequentally and would highly recommend the brand. Rated 5 out of 5 by Renovator from This vessel sink came quickly and is absolutely gorgeous. Home Depot had a great price for the e... This vessel sink came quickly and is absolutely gorgeous. Home Depot had a great price for the entire kit - sink, drain, faucet. I would highly recommend this to anyone! Rated 5 out of 5 by lindadear from Gorgeous This is very well made. And to find each product in its own sock is impressive. We love it.